Valentine’s Day, which is celebrated on Feb. 14 each year, will be here soon and several area residents are looking forward to continuing their holiday traditions. These residents commented about their traditions. Anne Buckvold, St. Joseph City Council member and school mental health counselor, said she usually makes Danish Frikadellar, which is meatballs with ground beef and ground pork, in the shape of hearts for her children Harriet, 11, Jesse, 10, and Ingrid and Francine, both 5. Buckvold, who lived in Denmark for four years, said she thinks this is funny because in Denmark most Danes don’t celebrate and often don’t even like Valentine’s Day. Buckvold who has been married to her husband Sam Johnson for 16 years said she likes to buy her meat for the Frikadellars from the St. Joseph Meat Market. Glen Werner, College of St. Benedict athletic director, said she and her daughter began a tradition at their house which led to Valentine’s Day becoming her daughter, Sam’s, favorite holiday. They began by celebrating Valentine’s Day with a lobster dinner and sharing their “best,” “worst” and “weirdest” of the day. Their only rule is they have to say the answer in a sentence and not only one word. An example is describing in a sentence why something was your best part of the day. “I like our silly little tradition because it is a built-in way to get her talking without asking ‘How is your day?,’” Glen said. “I like our tradition because it is a fun way to talk about my day without my mom asking me a million questions,” said Sam, who is an eighth-grader at St. John’s Prep. Gail Stanger, Netgain vice president of Client Services, said she became a great aunt almost 14 years ago and enjoys sending Valentine’s Day packages to her great- nieces and nephews each year. 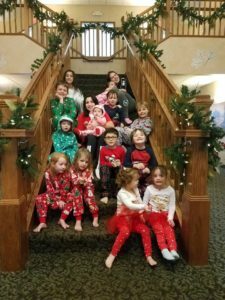 Stanger, who usually gathers with these children at Christmas time, said she enjoys frosting cookies with them and usually gifts them with pajamas but wanted to do a little extra so she began mailing Valentine’s Day packages to them. The children live throughout the state and Stanger mails the packages so they can get something fun in the mail. She said these traditions which started out small have grown and now take a little more planning. Nikki Svihla, a photography enthusiast, said she and her husband Chris often exchange cards and a bottle of wine. They like to give their children a valentine-themed stuffed animal, card and treat. Chris will often also buy flowers for their family. Svihla said she remembers her father also giving her and her sisters cards and often flowers while they were growing up. Other local Valentine’s Day traditions have included schoolchildren exchanging classroom paper valentines and creating boxes to hold them, or exchanging candy, roses and other flowers, cards and other gifts. Engagement proposals, weddings, eating out for dinner and other traditions also often occur on this holiday. According to CNBC.com, Sweethearts, the conversation candy hearts, will be missing from store shelves this year. New England Confectionary Co., the company that manufactured the hearts, went out of business last summer, but a new company Spangler Candy Co. hopes to offer them again next year. What are your holiday traditions? If you don’t currently have any perhaps you want to start some new ones. A few facts listed on the softschools.com website include the following about Valentine’s Day. • There are at least 36 million heart-shaped boxes of chocolates sold on Valentine’s Day each year. • There are enough candy hearts made each year to stretch from Valentine, Ariz., to Rome, Italy, and back again. About 8 billion of these candy hearts are produced. • There are about 50 million roses given on Valentine’s Day around the world. • Women buy about 27 percent of flowers sold on Valentine’s Day. • About 15 percent of women send themselves flowers on Valentine’s Day. • About 1 billion Valentine’s Day cards are exchanged in the United States each year. • Valentine’s Day is the second most popular day of the year for sending cards, second to Christmas. • Women tend to buy about 85 percent of all Valentine’s Day cards sold. • Men spend, on average, double the amount of money on Valentine’s Day than women do. The average amount a man spends is $130. 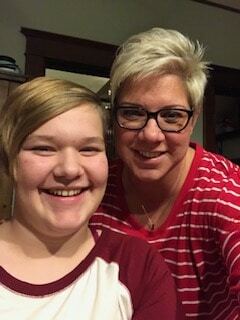 Glen Werner (right) and her daughter, Sam, started a Valentine’s Day tradition several years ago which encourages them to talk about their day in a fun way. Gail Stanger likes to mail Valentine’s day packages with a personally written note to her great-nieces and nephews. Those pictured include (top to bottom, left to right) Leah Rameriz, Belle Warren, Kingsley Loso, AJ Loso, Hannah Rameriz, Lilly Hawkins, Daniel Hawkins, Drake Hawkins, Delaney Dawson, Tyler Rameriz, Talon Hawkins, Evie Loso, Ella Loso, Lilly Mutzenburger and granddaughter Addie Stanger. Anne Buckvold (left) enjoys making heart-shaped Frikadellar for her children on Valentine’s Day. 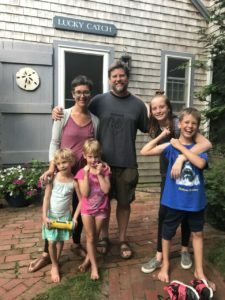 Buckvold and her husband, Sam Johnson, are pictured with their children (left to right) Francine, Ingrid, Harriet and Jesse, at Cape Cod last summer.